Whether watching the GA girls step up to the podium to run one of our all-school assemblies or, on a broader scale, listening to the news regarding the upcoming elections, this year's community theme of leadership seems particularly relevant for Greenwich Academy. 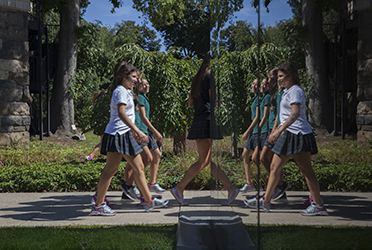 The Greenwich Academy Annual Dinner served as the official launch for LEADING THE WAY, a $75 million campaign to transform GA's campus, promote programmatic innovation, and invest in our community of students and faculty. Writing takes perseverance and passion, says Dusti Bowling. The children's author visited Greenwich Academy Thursday to talk to Lower and Middle School students about life in the desert, publishing, and the importance of being true to oneself. Real-life, research, and a healthy dose of imagination—those were the key ingredients in Hannah Tinti's novel "The Good Thief." On Monday, the author and NYU creative writing professor spoke to an audience of GA and Brunswick Upper School students who had read her novel over the summer. GA senior Caroline Carey named National Merit Scholarship Semifinalist. The Pre-Connecting Class expands to 30 students and construction of a new building with two classrooms and shared learning spaces is underway. For the first time in the program's 16-year history, Greenwich Academy took home the Charles D. Cole trophy, awarded to the team with the most overall points at the New England Interscholastic Rowing Association's Championship regatta. On this perfect spring day, the 90 members of the Class of 2018 celebrated their graduation from Greenwich Academy with family, friends, and faculty. Greenwich Academy's water polo team captured their third straight New England Championship on Saturday with a 12-6 win over Phillips Exeter. Shaheen Mistri '88 and Megan Mukuria '95 are daily putting into action GA's motto, "Toward the Building of Character." Ms. Mistri is the founder and CEO of Teach for India and Mrs. Mukuria is the founder and CEO of ZanaAfrica. Middle School robotics teams, GAtastrophe and RoBros, competed at the VEX IQ Worlds in Louisville, KY with impressive results. The Charter Day assembly, a celebration of our school's founding in 1827, is the last all-school assembly of the year, and has something for everyone. When ticket sales went live for GA's spring party, Live from GA – lt's Saturday Night, the show was sold out in a matter of minutes. Not surprising since the evening's headliner was comedian and SNL co-head writer Colin Jost. Melissa Groo '80 returns to campus for an exhibit of her incredible wildlife photography. "I love your uniforms. They are very attractive!" said Helen Lester at last week's Lower School assembly. The girls were not in their usual uniform plaid, rather, they had been awarded a "tacky" civvies in a nod to Mrs. Lester's series of Tacky the Penguin books. The fourth annual GAINS Conference gave 110 girls access to New York-area universities, global corporations, and professionals who are at the top of their fields. Upper School history teacher and Luchsinger Gallery Directory Kristen Erickson discussed GA's experience as the first school in the U.S. to host The Portal Project. 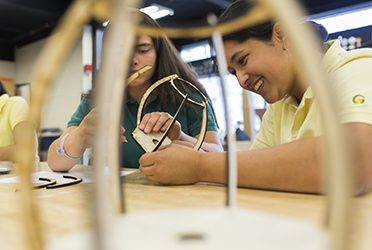 Engineering and Design Lab Director Erin Riley shared her MakerEd project innovations with other makers and educators. Today Head of School Molly King, along with 92 other CT independent school heads published an open letter on gun safety to elected officials. From the first event to the last, the NEPSAC Division I Girls Swimming Championships featured a Greenwich Academy theme. The Gators made their mark in each event and by the meet's conclusion they were primed to hoist the championship trophy for the second straight season. Neither power outages nor fallen trees nor blocked roads can keep the GA girls from achieving their goals. In the aftermath of Friday's Nor'easter, GA's Middle School robotics teams still managed to make their way to Saturday's VEX IQ CT State Championship at Central Connecticut State University and bring home some impressive hardware. Sixty Middle School girls descended on the GA campus last Sunday, ready for battle—Battle of the Engineers. In teams of two to four students, girls from Greenwich Academy, Stanwich School, Greenwich Country Day School, Sacred Heart, and the King School participated in GA's second annual engineering hackathon. Local students turn out for Greenwich Academy's Writers Festival, featuring Wendy Walker, Sally Wen Mao, and Adam Haggiag. "The bro culture of Silicon Valley has been keeping women and people of color from being successful," said Upper School assembly speaker and GA parent Heather Cabot about the challenges faced by women at start-ups and other tech companies. Clinical psychologist and New York Times best-selling author Dr. Wendy Mogel was the featured speaker of last week's Parent Program. Dr. Mogel offered sage parenting advice derived from her years of work with both parents and children. Group V Girls Eager to Enter "Shark Tank"
Ever wonder what GA fifth graders like to watch on TV? It seems Shark Tank, the reality show featuring aspiring entrepreneurs, is at the top of their list. And when a couple of those entrepreneurs visited GA to discuss their company and their experience "in the tank," the girls were star-struck. Greenwich Academy's squash team claimed the Patterson at the 2018 HEAD U.S. High School Team Squash Championships at the Philadelphia Cricket Club. Melanoma Research Alliance Chief Science Officer Dr. Louise Perkins met with Upper School girls last week to discuss her 30-year career in cancer research. MLK Assembly Brings Together "Beloved Community"
The colorful quilt squares are inked with words like unity, resilience, trust, hope and harmony. Crafted by the Greenwich Academy student body and staff, they are a patchwork representation of Martin Luther King Jr.'s message of equality and inclusion. A caterpillar, a disco ball, and a spaceship were just a few of the dazzling bubble creations featured in last week's Lower School Bubblemania assembly.